It booted up the same as Slackware 12.2. Like last time I hit enter. It also once again asked about my keyboard and I hit enter – just like last time. Once again, you had to log in as root and prepare the hard drive partitions. Apparently none of this had changed since Slackware 12.2. Then again, most of the time the installers for other distros don’t change. (Although they do take occasional leaps like Debian) Once again, the virtual hard drive was at /dev/hda. This time I gave myself 512 MB for swap. I type setup. It looked exactly the same as before. In my review of Slackware 12.2 I remarked that those who said that Slackware was full of outdated software were wrong. Slackware often had the latest versions of programs available at the time of its feature freeze for the current version. This is also true with file systems as Slackware 13.0 gives the option of running ext4. I decide to choose that for this installation. I choose ext3 for /boot in case LILO requires that. I then choose to install from the DVD. 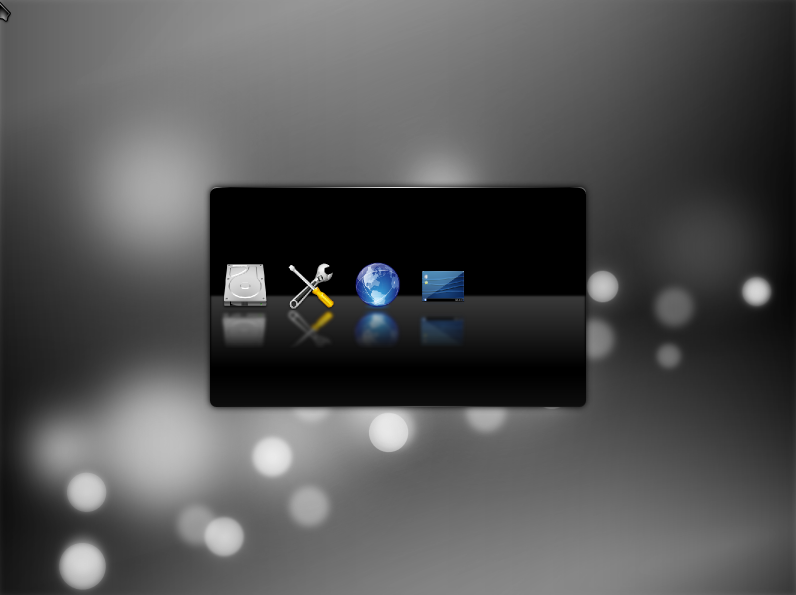 Once again I did a full installation of all the software groups. This started at 2211 and ended at 2251. This is considerably faster than last time, although I am now on a Dual Core machine that very likely has optimizations for virtual machines. I then installed LILO and it was onto mouse configuration. I then started network configuration and gave the computer the name slackie. Then came startup processes and timezones. I decided to select KDE as my default window manager this time around since I was curious to see how Slackware had decided to handle KDE 4.x. After setting up the root password I was done. Time to reboot without the CD/DVD loaded. As per usual for Slackware, I was left at the login prompt. I logged in as root and, as before, there was an email from Patrick. Always a nice touch. I then added a user. Awesomely, when it was time to select what groups to add the user to, pushing the up arrow gave the basic ones you’d most likely need. I logged out of root and in as my new user. I typed startx and it went right into KDE 4. (No KDM) A pretty neat startup sound played. 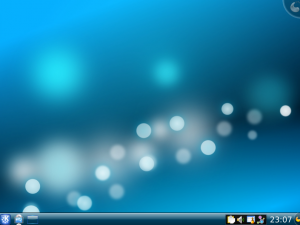 And I was left with a very nice looking desktop. I decided to see what was installed by default. Basically, it appears that all the standard KDE programs are included. This means that the top-notch KDE educational software is installed. (Gnome doesn’t really match KDE at all in this category!) There are also tons of games. These are simple games like pacman clone, sudoku, battleship, and so on, but there are a lot of them. For graphics programs we have Karbon, Krita, and KolourPaint. Internet has all the Mozilla apps as well as all the KDE apps. Multimedia has xine, xmms, Amarok and Dragon Player. Office has the full KOffice suite and it’s at the 2.0 version! Lots and lots of widgets are on tap to add to your background as well. 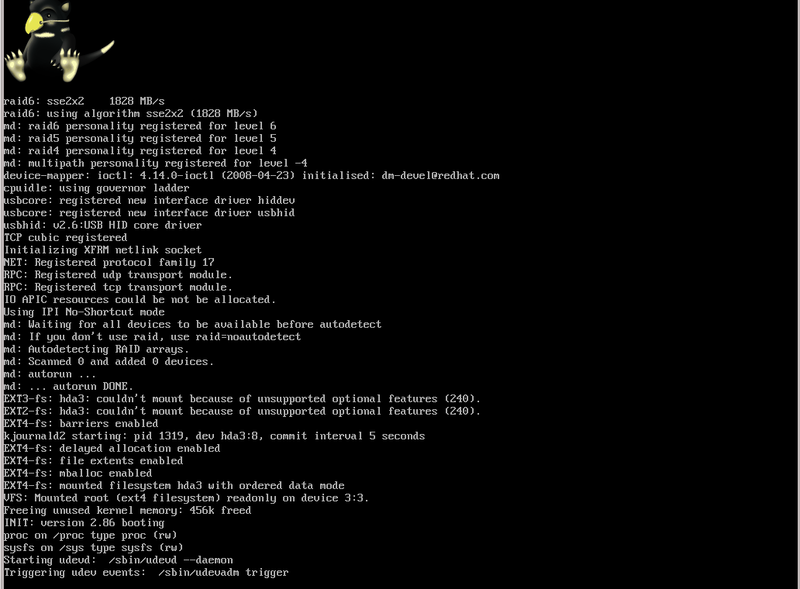 Slackware 13 seems to really have a lot of great applications on first install! There’s also a pretty sweet logout message. I played around with Slackware’s implementation of KDE 4.2 and found it to be a pleasurable experience. I think Slackware has definitely benefited by waiting until this release to switch to KDE 4. In the end, Slackware continues to grab the latest software and it continues to be the distro that leaves a lot of the decision-making to the user. I have not yet tried Arch Linux, but I intend to try it soon. It seems to be a distro trying to take the crown for most customization away from Slackware and Gentoo. While Slackware’s installer hasn’t changed or evolved at all, it wasn’t too hard in the first place as long as it wasn’t your first time and you had a guide to follow. As many people mentioned in my last review, the fact that Slackware doesn’t do dependency resolution is a good thing and won’t change any time soon. For me this means that if Slackware came with what I wanted, I’d be happy. For my personality, I don’t want to hunt for dependencies so Slackware isn’t for me. I want to say you should definitely give Slackware a shot, even if you never use it for more than a few days. It will be a good experience to see programs and desktop environments without any distro meddling or branding. Overall, it is a solid release and KDE was more stable on Slackware than I’ve ever experienced it in Fedora. Good job Patrick and others! Slackware 13(In my case the 64-bit edition) was almost flawless… Issues: lack of openoffice and the ugly looks of firefox due to lack of gnome? GSB does seem to fill that void! Yeah, it did kinda stink that OO.o wasn’t there, but it definitely was flawless. It felt more stable than any other distro I’ve used. Since I’m on this new computer with more hard drive space, I might even play with Slackware 13.0 some more and do a follow-up (no promises). By the way, what is GSB? It’s an offshoot of Slackware that takes basic slackware and adds Gnome rather than KDE for the DE. Don’t expect arch to have more customizability than Gentoo. What arch does great is keep things simple. (KISS) For that reason alone, it is a pleasure to use. Sadly, to compile arch from source, it takes a lot more effort than a binary install. I look forward to its review. OK. I’ll keep that in mind. I want to do it soon, but I’m not sure what my schedule will allow. 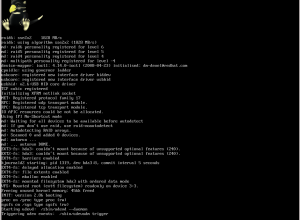 Slackware 13.0 just came with lastest softwares and it still is simple, fast and hard as a rock. The closest experience to Unix-like world that a Linux can be. Keep it doing that Great job Pat and crew!!!!! If you want KDM to appear on boot rather than the cli login screen you can change the default run level in /etc/inittab to 4 and reboot, after that your system will boot into KDM. And if you want openoffice.org you can use the slackbuilds.org build script (http://slackbuilds.org/repository/13.0/office/openoffice.org/) to install it manually using their howto (http://slackbuilds.org/howto/) as a guide, but if you like the apt-based style of some distros you can get sbopkg (http://www.sbopkg.org/) and use it to automatically builds a package for openoffice and install it for you from the slackbuilds script.